There’s way, way more to this story that I’m hoping to discuss with my littles – but on the surface, it has nothing to do with St. Paddy’s day or our Boston-Irish heritage. It’s about revolt. And tenacity. It’s about the resources of Irish women, using wits to get by when there’s nothing left but blight and and bleakness. It’s about our ancestors, and exploitation, and what responsibilities we have as colonizers, occupiers, and neighbors today. In a sea of books full of dudes searching for gold, and meh stories about St. Patrick and snakes/praying/god – Clever Fiona outwitting the leprechaun King is a nice respite. 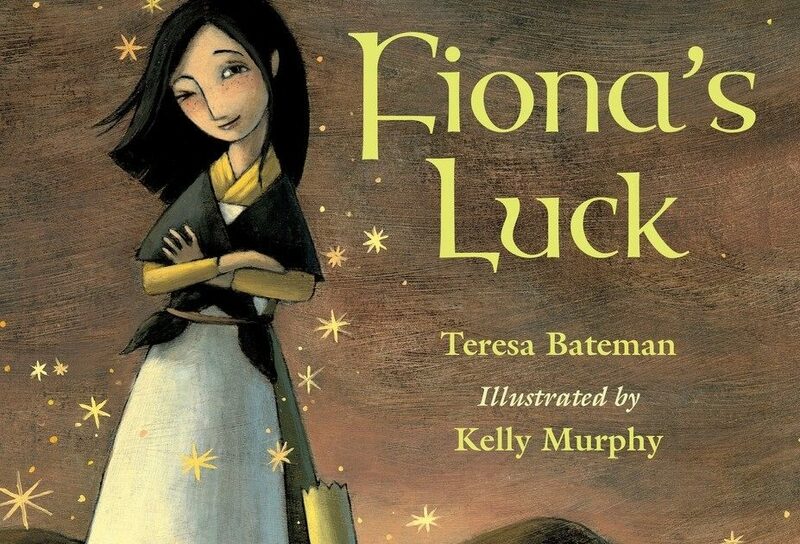 I’m playing the long game here, but to celebrate our Irish heritage, we read this silly book about a woman who values her wits over luck and conscious action over privilege. Smart, scrappy Irish women pulling one over on entitled rich dudes who hold all the power? Now THAT is a family legacy I want to celebrate. But the history of our people’s fight against exploitation sets the stage for how we handle foreign relief, asylum-seekers, and the division of wealth and power in the world my sons have inherited today, far from home, across the ocean from where we started. Let’s dig a bit deeper into this book. ‘Fiona’s Luck’ takes place during the Great Hunger and potato blight – the same event that drove my ancestors from their homes in Ireland to Boston. Imagine, if you will, me as a young child, listening to my Irish mother lecture me (quite heatedly) on why we are not fans of the British. She had some THINGS to say about imprisonment, enslavement, and exploitation. She’s like, 4h(? )-generation Irish American. We hold grudges, apparently. If you dig just a little bit into the history for the Great Hunger, you’ll find a long-standing resentment against the British that lasts to this day. While our families starved, the wealthy British Empire sat idly by, watching our ancestors suffer and die of starvation. When I say ‘wealthy,’ I mean the occupying British Empire could have easily provided enough aid to feed every Irish citizen throughout the blight without blinking. (Colonizing poor countries and exploiting natives is a great way to build up capital). There was plenty of food. This was no famine. Thats right. This dude actively cut aid that was ALREADY in place OFF – with cold, malicious intent. This was an intentional starvation of Indigenous Irish people. This was a culling. The end result was a near-obliteration of Irish traditions, language, and family lines, displacing hundreds of thousands of Irish citizens and killing a million children, parents, siblings, and loved ones. It decimated our people and spread us thin. From there – political tumult, civil war, and revolution that ravaged the country and the people long after the potatoes came back on the homeland, with thousands of emigrates left to die on ships or build a life in lands violently hostile to Irish minorities. *Thanks to BFL supporter Kerry P. for bringing this language difference to my attention. Be like Kerry! So, knowing this tidbit of history – this story of the wealthy and powerful bogarting all the resources, leaving the Irish to starve… it takes on a bit more meaning – yes? That’s why, when I see my own family assimilated into US life, generations later, still holding grudges, still feeling the pain of injustice, still reflecting on the horrors of the past, I am baffled. I’m baffled because we REMEMBER. We pass on these stories and remember being the people who were reviled, banned, and hated. We remember the discrimination and violence. We remember the powerful and wealthy stepping on us, exploiting our labor, and leaving us to die. We remember how hard it was to get jobs, affordable housing, healthcare, political representatives, and a reasonable chance to support our families. Once upon a time, we weren’t ‘white.’ And yet – we’ve forgotten. We assimilated, and we forgot. And we became the powerful – hoarding gold, wealth, citizenship, and safety. Freaking leprechauns. How on earth can any Irish-American know this history and fight for a Wall of Hate, a Muslim Ban, a block against refugees, a simple truth that Black Lives Matter is BEYOND ME. How we do the EXACT SAME THING and refuse adequate aid to Puerto Rico without blinking is BEYOND ME. We are the children of refugees. We were hungry, and tired, and poor, and wretched, and we were allowed to nurse our wounds and build a home here. So that clever Fiona – the woman who outwits the Bri- erm… Leprechaun King, she’s the one who perseveres and carries on. Family of mine – Remember Fiona, and please teach our children where they come from. *Apparently, we don’t hold a grudge forever. My partner is the most British-looking of British dudes there ever was. He presents me with a plate of nachos every night in reparations, though. Captioned age ranges are for when my sons were able to understand and enjoy each story. Accessibility image description: Images are book covers of the following titles. Clever Fiona outwits the greedy leprechaun King. Simple on the surface, this book highlights an Irish woman who values her wits over luck and conscious action over privilege. Doing something for the love of it, rather than the money. Great story, horrible illustrations. It’s been like two years since I read this one, so I’ll admit I’m fuzzy on the details. Silly and fun, this story is basically nonsense. Mixing the myth about St. Patrick driving the snakes out of Ireland and a new origin-story on the Loch Ness Monster (which isn’t even in Ireland), it’s got good and bad points, but mostly I like how mischievously weird this story is. Dammit! Also St. Patrick leaves the snake in a chest under water for years, promising to come back tomorrow. That seems like a douche move for a future-saint. It’s a completely irreverent, made-up tall tale that doesn’t really belong in this collection, but it’s funny and bizarre and it’s my website so I can do what I want. Also something about the relationship between these two foes feels mythic and refreshing. AWESOME. I mean – this is actually a decent story about priorities and competition. After some hemming and hawing about helping a stranger in need instead of working to win a local competition, a brilliant and kind little girl insists everyone hold up and prioritize compassion over competition. The result will be obvious, but I love the conclusion – they decide competing over this meaningless trophy is actually not worth it, and sart celebrating St. Paddy’s just for the joy of it, rather than some meaningless trophy. I thought my son would hate this because of the dated illustrations. About halfway through, it got a little boring and repetitive. But Q really loves these kinds of immigrant-heirloom-family narrative stories when they’re tied to random things like shovels and sticks, apparently. There’s no accounting for a 5-year-old’s taste – he eats his own boogers. So. Ohhhkay I made it like 4/5 of the way through this before I started choking up, and I think I deserve some credit for that. Even though I was basically crying too hard for Q to understand the ending. Similar to ‘St. Patrick’s Day Shillelagh,’ (but way better)we see the story of a little girl with attention-deficit-disorder (it’s not explicit, but she’s coded that way) as her family loses everything in the potato blight, says goodbye to home and family forever, and flees to the harsh urban cities of the US. So good! Lots of interesting things to learn about Irish history, and a couple delightful features on women’s history, such as Queen Maeve the Warrior and the Pirate Queen, Grace O’Malley. This story made me feel homesick and I’ve never even been to Ireland. Clearly Eve Bunting is in cahoots with the Ireland Tourism Bureau, because it’s giving me a serious jones to visit all the places in this book. Absolutely nothing to do with St. Paddy’s day or Ireland specifically (although it does take place on the headlands of Ireland), but the author sent me this book (disclosure: for free!) all the way from Ireland because we’re all about disruption and fighting injustice over here, and this story fit in beautifully. But really – there is something about it that has the same feel as Fiona’s Luck – something that captures the undercurrent of scrappy, resourceful Irish endurance. I’m starting to recognize this particular flavor of endurance as a uniquely cultural Irish thing. In this story of worms organizing in collective action against wealthy developers who are poisoning their land, we see more of that tenacious and resourceful will to survive. For many reasons, this is book is imperfect. But until we get a better version of it, we need to read it with our Irish American kids. The author is white, and with that limitation comes a good deal of whitewashing and inserting a European narrative where none existed. For example, childism – the protagonist in this story doesn’t learn about the Trail of Tears until he’s a teenager, and that’s highly unlikely in a Chocktaw culture where adults value and respect the ability of children to handle difficult truths. There’s also a surprising failure (given the fact that the author is Irish) to disambiguate between the people of European colonial empires (the English and Spanish) and the people they’ve invaded and occupied (the Irish) – particularly since the Hunger is a direct result of colonization. But whatever – we count as white in the US now, so I can’t get too riled up about that. That said – this book was a link for us, tying together the experience of one colonized people to another, and the way we must pull together. This book serves as a reminder that while we are settlers on Native land without their consent, our family have also been beneficiaries of intentional Choctaw generosity, and we have an obligation to work for Indigenous rights, not as saviors and victims, not with settler guilt, but as one people who work together in solidarity against colonization. Get more updates like this – sign up for twice-monthly email updates below and get more book discussions to help you raise kind and brilliant kids. This Irish-American mom LOVED these suggestions – thanks! These sound amazing! Thank you, Maura! I can’t wait to check these out!